A McAllen police officer leans against his car on North 46th Street in McAllen near the home at which an off-duty McAllen police officer suffered a gunshot wound on Friday, July 20, 2018. McALLEN — A 25-year-old man has been charged with aggravated assault with a deadly weapon and manslaughter, charges which stem from the shooting of a pregnant off-duty police officer who lost her unborn child as a result of the incident. Jesus Abides Campos was arraigned Sunday in McAllen’s Municipal Court on the first and second degree felony charges, and his bond was set at $350,000. 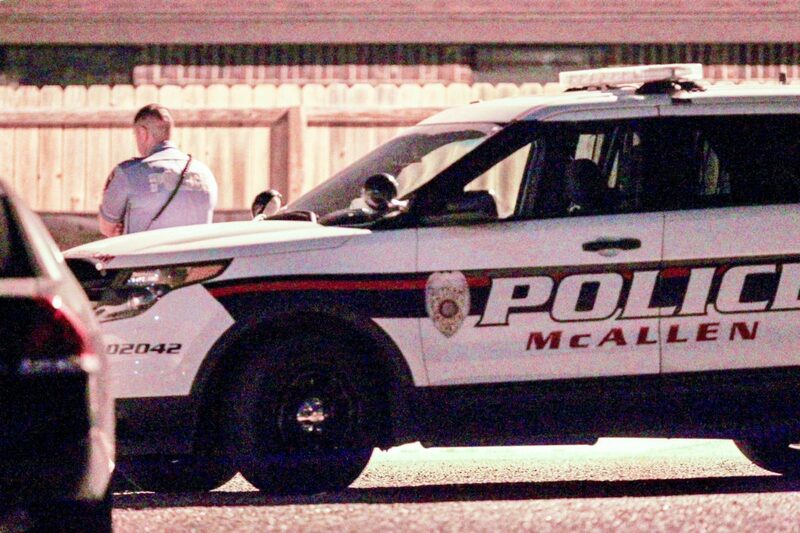 Campos and the officer, who has been identified as Monica Treviño, both told police the shooting was an accident, according to McAllen police offense reports filed by officers called to her North 46th Street home shortly before 9 p.m. Friday. Treviño, who was 30 weeks pregnant, managed to call for help using her portable dispatch radio. She said she was “shot accidentally” in the stomach by her common law husband after she walked in front of an assault rifle, which he was cleaning and assembling on the kitchen table, according to the offense report. Campos told police he received the AR-15 rifle in the mail earlier that day and was putting it together while his wife watched. Once he loaded the magazine, he “never heard the charging handle to the rifle go forward” and pulled the trigger, according to the report, at which point he realized he’d shot his wife. Campos has been employed at Evins Regional Juvenile Center since February 2017 as a juvenile correctional officer III, according to a Texas Juvenile Justice Department spokesperson. Another officer, who hearing his colleague had been shot, told investigators he saw the pair at a Tru Fit gym four hours prior to the shooting and that it “appeared the two had been arguing or having a heated discussion,” according to a supplemental report. Campos remained in custody at Hidalgo County jail as of this posting. Treviño’s status was last reported as being in stable condition Saturday. This story was updated to include information from a probable cause affidavit.